INTRODUCTION: Are you interested in changing the world? We have seen many world-changing ideas since 2010, including Little Free Libraries, Pinterest, Kickstarter, the Then and Now app, and the New York Public Library StartUP! LIBR579M/ARST 575M is for students that are interested in starting a business or nonprofit organization, want to promote innovation across information organizations, or want to learn more about the current wave of entrepreneurship program models and resources. This course introduces students to The Lean Startup Model, Startup Weekend, Startup Labs, and other current experiential entrepreneurship ideas that promote innovation and entrepreneurship. Students will use these models to start a for-profit or not-for-profit venture. This is a “flipped classroom” where class time will be used to present and work on startups in library and information science. Who is Bruce Kingma? 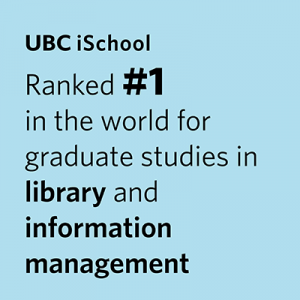 Bruce Kingma is the Dodson Visiting Professor in the iSchool at UBC this fall. He is a professor in the iSchool and Whitman School of Management at Syracuse University in New York and co-owner of Kingma Inc., an interior design company. From 2007-12, Kingma served as the Associate Provost for Entrepreneurship and Innovation at Syracuse University, bringing Startup Weekend, Tech Meetups, and Hackathons to Central New York. Kingma mentored or coached over 500 student ventures during this period. What is a flipped classroom? Teaching entrepreneurship from a textbook is like teaching swimming using a chalkboard. Swimmers have to get in the pool. Creative, innovative, entrepreneurial students must engage with customers, clients, patrons, users, and the community. Each week you will be pitching an idea or presenting your progress on your venture. Everyone will critique presentations. You can work in teams or individually. It is also expected that you will be participating in Startup Weekend, a Tech Meetup, Hackathon, or similar experience in Vancouver this semester. Can I do a nonprofit, social venture or innovation in my library or archive? Yes, you can start a business, nonprofit, social venture, or an innovation in your organization but you MUST determine how the venture or innovation will be paid for. You MUST talk to customers/patrons/users/clients to determine who wants your innovation and who is willing to pay for it. GOALS: Innovation and Disruptive Entrepreneurship gives students the opportunity to start a venture and provides you with a step-by-step guide to building a successful for-profit or not-for-profit venture. Use current customer-validation models to insure the value of products and services. Participate in and run a Startup Weekend and business plan competition.